Lose yourself in our larger-than-life natural landscapes. Go adventuring in our parks. Climb our mountains. Dive into our lakes. Soak up the tranquility that surrounds you. Come and meet our artisans, food producers and shopkeepers. Discover our picturesque villages, whose rich (and sometimes tumultuous!) histories, echo down the ages. Sample our gourmet food, our wines and our unique beers—products of our very own microbreweries. The Eastern Townships (Cantons-de-l’Est) region sits side-by-side with Vermont, New Hampshire and Maine, running along the American border for 300 km. Besides a wide range of tourist accommodations, going from family-run B&Bs to full-service resorts, the Eastern Townships region features some rather unusual places to stay. The Parc national du Mont-Mégantic, for example, offers fully-equipped Huttopia tents, rustic shelters (suitable for groups) and the EXP, glass-walled “nature” cabins with an open-plan living space. Other unusual accommodations in the region include “troglos” (inspired by The Hobbit of J.R.R. Tolkien fame), “treegloos” (tree houses), yurts and tepees. One of the latest concepts is the eco-friendly “zoobox” – a loft-style, energy-efficient, 538-square-foot space with a glass wall, nestled in the woods. In your Zoobox, you can generate—by pedalling—enough electricity to run a machine that will prepare you a delicious popcorn snack. The Eastern Townships is a food-lover’s destination waiting to be discovered through its three gourmet brands: Chefs créateurs (Creative chefs), Cafés de village (Village cafés) and Créateurs de saveurs (flavour creators). Our Chefs créateurs share an enviable reputation and a mission to reinvent dishes using local products. 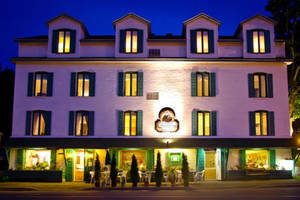 They offer a refined dining experience with their innovative recipes featuring foods from the region and local flavours. Cafés de village are part of a select network of coffee shops where you can savour a piping hot beverage, along with regional and seasonal products, and discover the village’s well-kept secrets. These locations are welcoming, friendly and, above all, down to earth. They reflect the heart and soul of their corner of the world. Look for the Créateurs de saveurs brand, a symbol of quality for cheeses, cider, wine, honey, maple syrup, wild boar, black currants and more! Taste the Townships! The Eastern Townships is the cradle of Québec viticulture, boasting two wine routes: the Route des vins de Brome-Missisquoi and the Route des vins de l’Estrie. The region accounts for over 60% of Québec’s wine production. Get those lungs pumping as you march up a mountain or meander along a nature trail! The Townships offer all manner of ways to enjoy a walk in the fresh air, and the trails—from short to long—are designed for every level of ability. Some wind through four national parks—Mont‑Mégantic, Frontenac, Mont-Orford and Yamaska—which offer a plethora of other outdoor activities such as camping, kayaking and canoeing. The Route des Sommets (Summit Drive), one of three tourist routes in the region, gives access to the loftiest peaks in this corner of Québec. Also, pedal power can get you from one end of the Townships to the other. The region has no fewer than 365 km (227 mi.) of designated cycling routes—some on former railway tracks, others along quiet country roads—leading through landscapes of rolling hills, interspersed with lakes, farms, vineyards and villages. Get a move on! 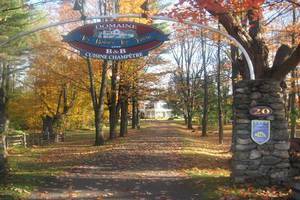 The Eastern Townships region developed the Bienvenue randonneurs (welcome hikers) seal, a certification that the accommodation offers services geared toward hiking activities (maps, trail information, snacks, etc.). In the Eastern Townships, our love of winter is expressed in our desire to awaken the senses in a warm and friendly atmosphere, against a backdrop of spectacular scenery. If you’re looking to escape into a winter wonderland by snowshoeing, hiking or cross‑country skiing, there’s no match for the Eastern Townships. 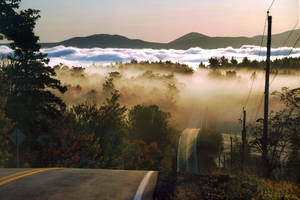 For a downhill getaway, take your pick of mountains: Bromont, Sutton, Orford, Owl’s Head or, better still, try them all! Enjoy the benefits of a massage or other body treatments, and take the plunge in a Nordic bath. At once tonifying and invigorating, the experience will bring you total relaxation. Want to practise your favourite sport in winter? Join the fat-bike craze, a fun way to make the most of the frosty season. With activities to please everyone in the Eastern Townships, the only problem you’ll have is fitting them all in! Ice wine came to be by accident! It was discovered in Franconie in 1794, when a cold snap froze the grapes on the vine. The growers decided to press the fruit anyway and were delighted by the sweet wine they produced. And that is the story of a Townships inspiration!